You know, Swindon is not a bad place to be if you want to get yourself off the sofa and get into the great outdoors. 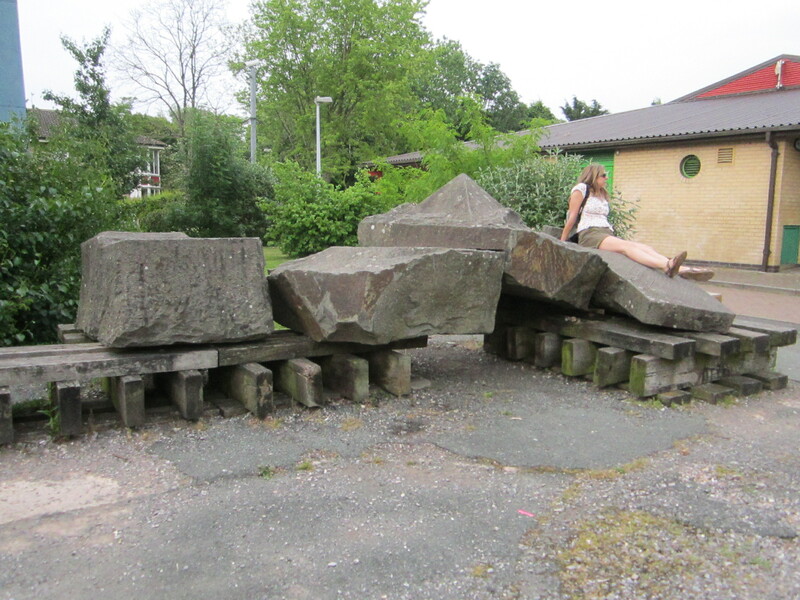 I’ve written at length here about the West Swindon sculpture walk and the walk along the old town railway path where the wheel sculptures are. But there are dozens more walks and cycle paths to be explored. Swindon is on the Sustrans cycle network for a start. Swindon benefits too from being flat in many areas so if, like me, you aren’t that keen on hills, you are in the right place. There are certainly numerous walks in Swindon that can be done in less than an hour – take a look here at ‘Get Walking- Keep Walking’ for some ideas. 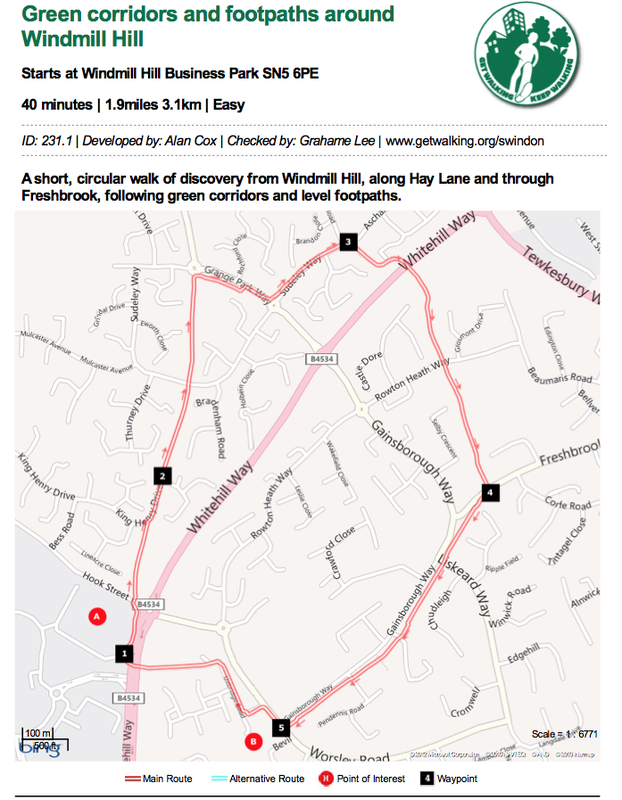 For a start there’s an easy 40 minute walk from Windmill Hill, along Hay Lane, through Freshbrook and back. If you are up to something more strenuous consider joining the Ramblers Society – they have walks mapped out up and down the county and have groups in both Swindon and Highworth. Here’s a link to a map of this sculpture trail. In part 4 of this series my companion and myself visited ‘Hey Diddle Diddle’ which is in The Prinnels, West Swindon. I explained about spending the last twenty years seeing but not really ‘noticing’ that sculpture from the bus and never realising the significance of it – which is a bit shameful when you think of it. Well I’m sorry to say that my chagrin doesn’t end there. Oh dear me no! The situation with this next one is very similar I’m sorry to say. Even as my friend and I were reading the ‘bumph’ about this sculpture I still wasn’t making the connection – and ‘connection’ is actually very apposite indeed. It was only as we approached Freshbrook that I realized what we were going to. Doh! Now, much like glimpsing ‘Hey Diddle Diddle’ several times a week from the bus and it never registering, the same applies here. 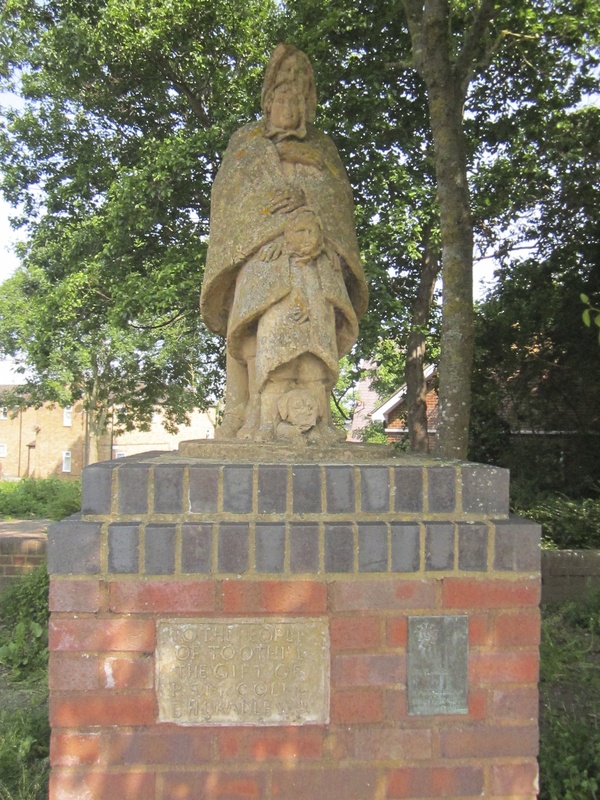 I walk to Freshbrook several times a week: to the Dr, the pharmacy and to Tesco, and every time I have walked past this thing and never really given it any thought. Well that’s no longer the case. I’m still not sure that I like this piece of art but having read about it and pondered on it some, it’s actually very interesting. The name of it for a start. The word ‘Nexus’ ( I did actually know this) comes from the Latin of ‘‘a binding together’, from nex- ‘bound’, from the verb nectere . It also has the connotation of meaning a connection or series of connections linking two or more things: the nexus between industry and political power.• a connected group or series: a nexus of ideas.2 a central or focal point: the nexus of any government in this country is No. 10.
b) It’s sort of at the centre of Grange Park, Westlea, Freshbrook itself and, to some degree Toothill – although that has its own village centre – well in so much as it forms a link – a Nexus – between them all – it’s central to them. Ergo I reckon, the idea of this sculpture is that represents the function of Freshbrook as a pivot for the above. I stress though that this is only my interpretation. It could have been meant as something else entirely. But then isn’t art a bit like literature – we can each get a different meaning from it? So, there you have it. Like I say, I’m not sure that I’d go so far as to say that I ‘like’ this one, in so much as it doesn’t trigger those indefinable pleasure receptors in me, in the way some of the others on this walk do. But now I’ve studied it and thought about it properly – for the first time in 20 years of looking at it but not ‘seeing’ it – I definitely find it interesting. And maybe that’s the thing with art? I dunno – I’m not Charles Saatchi or Brian Sewell – but maybe the thing with art is just to engage with it and work out what your own responses are..
And I think if there’s a message I want to convey in writing about these sculptures it’s this: right here on your doorstep you have this wonderful entity, this West Swindon Sculpture walk, but don’t just take my word for it all. Get out there, look at them, think about them and even if – like me with this particular one – you don’t necessarily like one or more of them (there are 8 altogether) – just appreciate how very lucky we are to have them. Because I really think we are. Here endeth the lesson! Anyway, at this point my friend Kim and myself concluded the walk as we’d been out for hours and were ready for dinner. So we had a swift pint in the Windmill and went back to mine for spaghetti bolognaise and a bit too much Chianti. As you do. As for the rest of the sculptures on the walk, I’ll do a round-up in another post – so keep an eye out for that. Bye for now! Freshbrook village centre is currently being regenerated and, as part of which, Nexus has also had a revamp. It has some nice new red tarmac round it and some signage. Hurrah!! ‘There are five wheels, from the Old Town direction towards the railway and Wootton Bassett Road they are Earth, Air, Fire, Water and Conceive. Each wheel has two parts, a small wheel showing the Element, and a large wheel with a short piece of poetry. In addition, there is a sleeper crossing the path between each of the wheel pairs. Each of these lengths of wood has two words written on them’. Well, I’m pleased to inform you that, thanks to the power of social media, I have now learnt a lot more about them. A follower of this blog kindly sent me some newsletters about the project which I am able to share on here. Thank you so very, very much for that. I’m really thrilled to see all this – and just think – only 5 days ago I had no idea of their existence….it’s a funny old world is it not? It was back in 1980 that the disused railway line running along the southern flank of Swindon was saved from development by Swindon bike group who offered to construct a path for walking and cycling. But it wasn’t until the mid-1990s that the bike group got an opportunity to get creative with the path -but the documents can explain it all better than me. They were large documents which I’ve had to break down into segments so you’ll have to ‘piece’ it together I fear. But you get the idea. The poet, Fiona Sampson, who wrote the words for the wheels said this: ‘The mix of the industrial and the natural and cyclic in Alec’s design made me think hard about the ideas my poems needed to bridge; but it also inspired me to think about words as solid, powerful’. EARTH: Our wheels relinquish and seize, relinquish and seize – curious tenderness. I have only seen two of them as the walk I was doing didn’t take in the whole of this path. But of the ones I did see…yep powerful would do it for me. And haunting too. 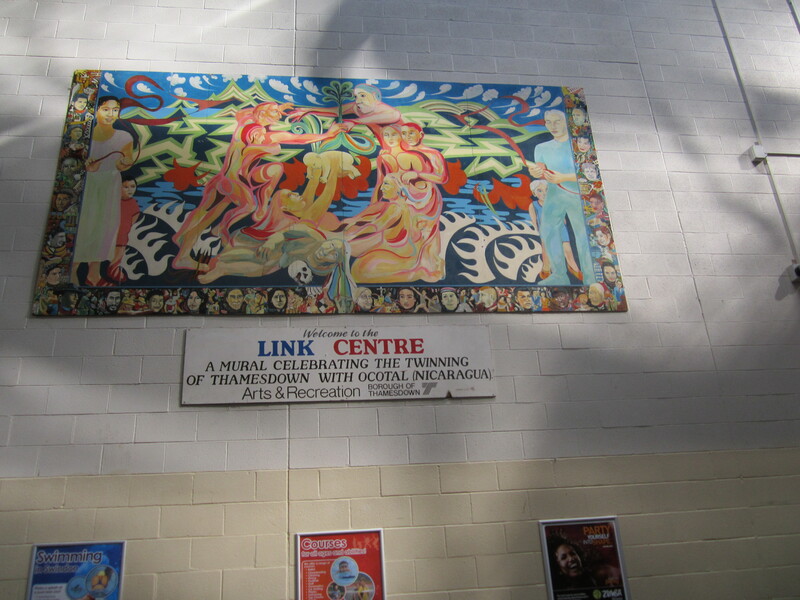 Oh – incidentally – the newsletter page with the magic roundabout logo on it speaks of a mural on Signal Way. Is that still in existence? Saturday the 1st of Feb 2014: Fantastic update! 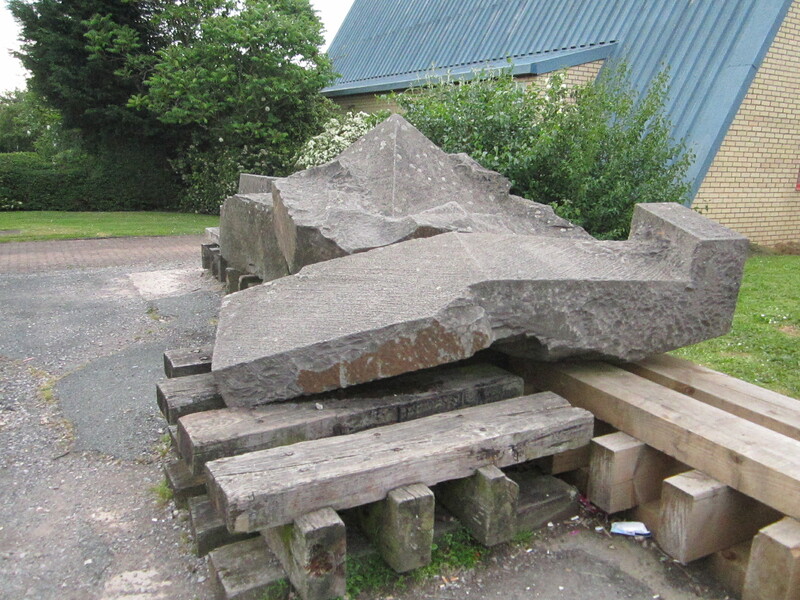 Swindon local collection, who are slowly digitising all manner of photos and documents have today added photographs to their Flickr photostream of these sculptures being created and installed. Just wonderful! In part 3 of this series I wrote about ‘White Horse Pacified’ a 1987 sculpture by Julie Livesey and created during an international artists exchange between Swindon and Lisbon, Portugal, funded by the Calouste Gulbenkian Foundation, Southern Arts and Wiltshire County council and the then Thamesdown Borough council. Leaving that sculpture to move onto the next one took Kim and I walked round some bits of what I term ‘proper’ places. By that I mean houses and areas that have clearly been here much longer than all this ‘new’ (70s, 80s 90s) development of Swindon. The walk takes you down Old Shaw Lane and right past Lower Shaw Farm – home of Swindon’s Literature festival amongst other things and close to the Nine Elms pub. It also took us via Shaw Village centre where, as it was a warm sunny evening, we stopped for ice-cream. Yet another reason why this walk took us hours! Of course, should the fancy take you to do this walk during the day-time, The Village Inn at Shaw would make a good stopping point for lunch and/or a pint being approximately on the mid-way point of this walk. Well, by this time we are getting closer to where I live but I still wasn’t making the connection. Talk about not really ‘seeing’ or knowing what is under your nose. It’s shameful. For twenty years I’ve been passing this thing on the 1A bus home from town and never realized. 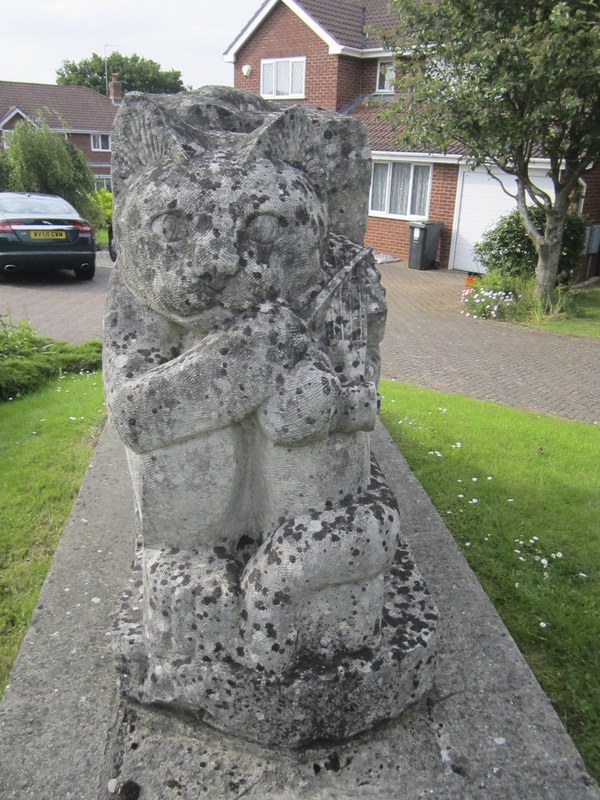 I’m not going to lie, I’ve had the thought ‘well, fancy having a huge stone cat in your front garden’ and similar – because it is quite literally in a front garden in The Prinnells (between Shaw/Middleaze and Grange Park) Oh dear. Though to be fair, as the bus swings by, the only bit of the sculpture you can see is the cat. But readers, this is so much more then a giant cat. Stop and take the time to examine it and you will see. As the descriptions says and the name implies, this sculpture is all about the well known nursery rhyme ‘Hey Diddle Diddle the cat and the fiddle…’ The roadside end of it is indeed the cat’s face but it’s only on closer inspection that you can see the fiddle. The other end has the cow’s face on it and the two sides depict the dish and the spoon, the moon and the little dog laughing to see such fun. I rather suspect he was laughing at me for not knowing what was under my nose. And quite right too. So anyway Kim and I thoroughly examined it and took photographs, of which there are more on the blog’s facebook page. Like so many of these sculptures it’s in need of a bit of TLC. Just a brush and some warm water would piff it up no end. If it was in my front garden I think I might be doing that. And perhaps encouraging visitors and offering cream teas! 🙂 Though before I get too judgemental I ought to consider that there might be some sort of clause prohibiting that. As with all the others so far, this is a really interesting and intriguing sculpture. I love the idea of it – representing a nursery rhyme in this sort of setting – as of course nursery rhymes and domesticity go together. But hey – don’t take my word for it – go and see it for yourself. ….to me at any rate. Yesterday (Sunday 21st June 2013)myself and couple of friends went out on an EXPOTITION: we set out on a walk – this walk to be exact – a circular route beginning and ending at Croft Leisure centre and taking in Croft Wood, Wichelstowe Canal and Town Gardens. It’s a lovely walk and I hope to write more about it in a separate post but for now I’m hoping you people out there can tell me something about the art works we came across on the old railway path and I’m guessing there’s a clue there. Suffice it to say that the blurb on the walk makes no mention of the art to be seen on the route, which seems a pity. Anyway…we only saw two of them – there’s a picture of part of one of them on the blog’s Facebook page I have managed to find this much – but yep – essentially: who? – what? – why? and when? I find them strangely haunting I must say. There are five wheels, from the Old Town direction towards the railway and Wootton Bassett Road they are Earth, Air, Fire, Water and Conceive. Each wheel has two parts, a small wheel showing the Element, and a large wheel with a short piece of poetry. In addition, there is a length of wood crossing the path between each of the wheel pairs. Each of these lengths of wood has two words written on them. AIR: On hot places behind your knees On high downs a ghost is growing. Depth & disquiet.